It's time for another round of the Knights of MicroFiction. 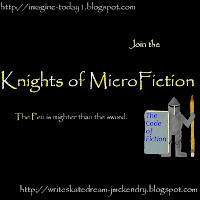 The Knights of MicroFiction is a bloghop hosted by me and Jess on the 15th of every month (except April, because the A-Z Challenge makes things crazy!). We came up with it as a way to meet new friends, help build the blogging community and (hopefully) spark your creativity! We reveal the prompts on the 13th and you have until the end of the 15th (11:59 pm) to post your reply. Just sign up on the linky list below. By the 17th Jess and I will choose two winners to be featured on our blogs. We really hope you guys have fun and meet lots of new people! We can't wait to read what you come up with! This time we are giving you 5 TELLING sentences to choose from. The object is to pick a sentence and create a scene in 500 words or less that SHOWS what the sentence is about. For bonus points, don't include the sentence you chose (or any alteration of it) in your scene. Your readers should be able to guess which one you described! He/she was in a bad mood. Crikey, she thought, that should put the cat amongst the pigeons. This phrase kept turning round and round in her head. She couldn't get it out. So she decided that would be the theme this year. Sixteen white doves would be released at the end of the evening which should clinch it as an extravagant finale to finish the day off. She made a list and then another and another. She bought a spiral bound notebook and wrote her lists in that. She had plenty of time to organise the event. Should she make a cake or have one made? How big should it be? How many people would be coming? Make a guest list. This will be bigger and better than anybody else’s. She could do this. This was not beyond her capabilities. Write a list of why she can do this. Write a list of why she can’t do this. Google what ‘pros and cons’ mean. Now write a list of ‘for’ and ‘against.’ If she writes the pros list in larger writing it will be longer than the cons list then that means that she can do this. Oh balloons! Write a list of types of balloons. White ones tied with silver ribbons to pick out the overall theme of silver and white. Helium filled, yes or no? When do you order those and pick them up? Oh food! Buffet style, finger food? Hot food? Another list to write. Write one more list of plates, cutlery and napkin colours. She goes to bed with her mind whirling in a maelstrom of ideas and thoughts. When she wakes up exhausted she can’t remember what she decided, so she has to look at her lists again. She remembers her dream from the night before. Can she pull it off? She writes a list of how to find out if it is possible. She has another thought. She researches and writes another list. The decision is made. The point is underlined in her list. A new page is started. A new list is made with a capital heading. Write a list of hotels and venues that have a large LED screen in their function rooms. Narrow the list down. Choose one. Colour scheme chosen - tick. Coloured helium balloons to be delivered to the venue - tick. Table favours in the shape of Star Wars Troopers - tick. White doves ordered - tick. People arrive on time dressed in their finery. Compliments flowed on the venue and decorations and food. The room buzzes with conversations, people are laughing, everybody is having such a good time, nobody wants the night to end but as midnight approaches she hopes the surprise will go down well. As the first notes of Ravel’s Bolero fill the room the large LED screen shows Torville and Dean skating in the 1984 Winter Olympics where they won the gold medal. It was the most interesting birthday ever? Wow! Torvill and Dean's Bolero was what inspired me to be a figure skater and coach 27 years ago. I like how you develop your theme. Great story. Sally this is awesome and I see you're one of the winners too! Congrats! Thanks for reminding me of Torvill and Dean's skating to Bolero. I watched it to death! I would have loved to have joined in this challenge but just ran out of time.